Eeep. What are you doing down here? Whoa. 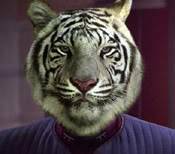 Bengal Tiger for Commanding Officer? This is getting awesome. I thought I would pay a visit, in the past TFCOs of 38 have ignored simms, letting them fend for themselves all the time, I'm trying to change that by mass threats of death, destruction, clawings and the like. I'm always present, but I think I'm at kinda of a stalemate with Akira. I can't really go too much further. Kinda need some progression or something. Yeah, I'm having the same problem, so for now I think I'm just going to get Mission One started so we have more to do, and leave the Prologue open for a little while so any Joint Posts or somesuch can be added in to fill out things. Sound good?